In October, I switched to a (mostly) vegan diet for health reasons, the only exception to that being that on occasion (once a week at most), I can have a piece of fish with my meal. I know quite well that most of you are not vegan, so I’ll be trying to choose adaptable low-cost recipes, ones that can easily be transformed with the addition of a few ingredients. Many of the recipes in my recipe box are handwritten and without source. If I can find a source for a recipe, I’ll provide it. 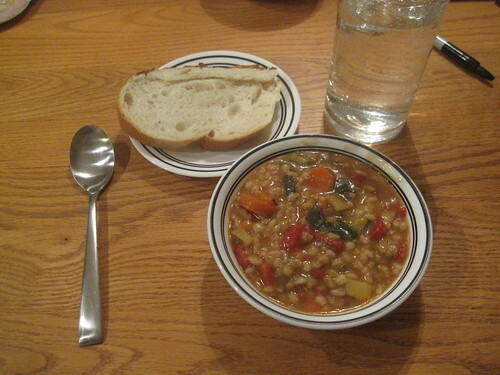 Last night, we had a vegetable barley soup, accompanied with fresh bread. The soup was actually thicker than expected and wound up approaching a stew-like consistency, but it was still flavorful. Every member of our family (over the age of one) cleaned their bowls, which is pretty much all you can ask for. It is a perfect recipe for a lazy winter Sunday afternoon around the house. Since we already had vegetable stock on hand (here’s how to make your own), all we really needed was a visit to the produce section of our local grocery store. Our total cost for the other ingredients was $8.98. This ended up making enough soup for three meals for all four of us, reducing the cost per meal well under $1. The bakery had an amazing sale on fresh loaves of bread straight out of the oven – $0.99. 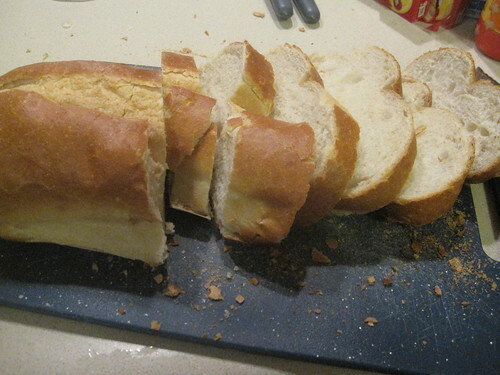 I had planned to make my own bread, which usually comes out to a slightly lower cost per loaf. You’ll obviously have to do a lot of chopping. Dice the onion and chop the celery – you can store them together in a bowl. Chop the potatoes and carrots – you can store them together, too. Also, chop up the greens. In the end, you’ll have three bowls of chopped ingredients. This will make the actual preparation of the meal very simple, and you can do this the night before if you wish. Don’t throw away your vegetable scraps. Instead, save them in a container and keep them in the freezer. When you accumulate several cups of scraps (yes, potato peels, carrot peels, the ends of carrots, all of that stuff is okay), you can make delicious vegetable stock with those scraps. 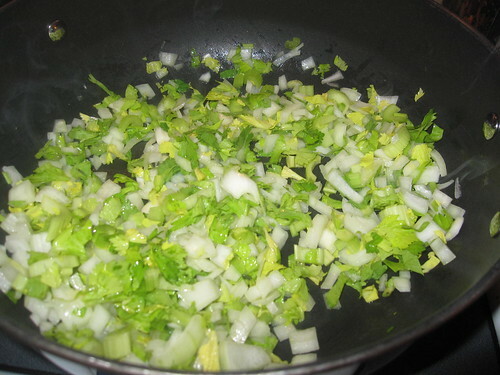 Put the onion, the celery, and the oil together in your soup pot, then turn the heat up high. Your goal is to brown the onions a bit until they take on that wonderful caramelized look and smell. This process will take five to ten minutes. Once the onions are looking tasty and brown, add the stock/water and the bay leaf. 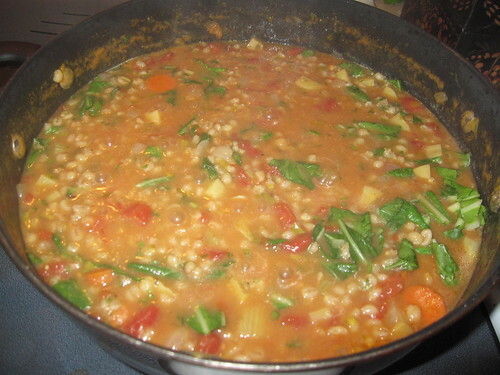 As the liquid is heating up, rinse off the barley, then add it to the soup. Your goal is to get the soup to a simmer – barely boiling. You’ll want to stir it regularly. Key point Different types of barley have different cooking times. Read the barley package you have and see how long it suggests for cooking. Subtract an hour from that, then let the soup simmer that long before proceeding to the next step. This might be fifteen minutes or it might be an hour or it might be anything in between. At the “one hour remaining” mark, add the tomatoes, the potatoes, and the carrots to the soup. You’ll now let this simmer for an hour, stirring regularly. The picture above shows what it looks like as it nears the finish line. We threw in a bit of extra barley, so ours is a bit thicker than yours might be. Another thing to note is that the color will vary somewhat based on the color of your stock, the color of the tomatoes, and so on. You’ll want to be preparing the bread at this time. We like crusty bread, so we tossed our bread in the oven for another ten minutes before slicing it. When the time is up, add the greens and the basil, stir them in, and let it simmer for five minutes more. Set the table, then put out the cauldron of soup for everyone to enjoy! If you’re looking for non-vegan ways to alter this meal, here are some suggestions. Ham This is a perfect soup for some diced ham. I would put the ham in when I put in the barley, to let the flavors spread throughout the soup. If you have a ham bone, don’t be afraid to drop that in there, either. This would be my preferred option. Ground beef or ground sausage I would cook this separately, then strain it very well before adding it. Adding fatty meats to soups can often make the entire soup taste fatty. Beef bullion If you’re adding ground beef to the soup, you could use beef stock or beef bullion instead of the vegetable stock or water. This would make more of a beef barley soup.